Summer is here and yours truly is headed off on a little "vay cay" to see some friends in lovely, sunny Daytona Beach! Woo hoo! I can't wait to see the palm trees, walk on the sand and swim in the ocean but before I got ready to go, I had the absolute pleasure to play the latest installment of Virtual Villagers!! Yay!! 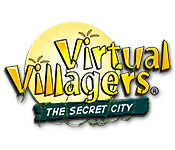 Virtual Villagers 3 - The Secret City, is the continuation of the legend of Isola. It's brought to you by the creative folks at "Last Day of Work," The geniuses behind VV 1 & 2, Fish Tycoon and Plant Tycoon! I tell ya, playing this game got me really psyched for hittin' the beach. I can't wait to run around the beach making lil' baby noises and "Look around excitedly at everything!" Ummmm.... If you're not familiar with the VV games that last statement made me sound like a real idiot, didn't it? Anyway, before I jet off the sunny "Eff-El-Ay," I wanted to makes sure you had a handy-dandy guide to refer to while I'm gone. A special thanks to the folks at LDW for posting so much info on their forums, especially the "Island Events!" I'll try to monitor the forums while I'm gone to help anyone who's stuck but the guide is pretty thorough so be sure to check it ~before~ you post! Have fun and watch out for sharks!! Oooo... yeah... I better do the same.